Why do we loose our tan? How does sunscreen protect us? A couple of days ago, I was having dinner with my friend Sebastian. He mentioned how some people thought that the SPF in sunscreen means the minutes it protects you. An FPS 15 would mean 15 minutes of protection. Others think it shows the percentage of radiation it reduces. In fact, the SPF shows how long your sunscreen protects you, but in a special way. It shows how many times your skin natural protection is strengthened. That’s why a person with low pigmentation, requires a sunscreen with a stronger SPF. Skin is a barrier that protects us and helps us to communicate with our environment. Furthermore, it protects us from ultraviolet radiation (UVR) by using its energy to convert tyrosine into melanin. Every year skin cancer surpasses colon, prostate, breast and lungs combined. Every 52 minutes melanoma kills a person. 5 early life sunburns duplicate the melanoma risk. Sunbaths produce more skin cancer than tobacco produce lung cancer. Epidermis is constituted by a squamous stratified keratinized epithelium. Cells maturate from the basal membrane to the stratum corneum (the exterior layer), renovating our skin. In addition, we have melanocytes, Merkel and Langerhans cells. Dermis, formed by papillary and reticular parts. The papillary is the superficial part, it separates by the dermis by papilla formed by connective tissue collagen type I and III. The reticular part has hair follicles, sweat and sebum glands, sensitive corpuscles and connective tissue. Hypodermis consists mainly of adipose tissue, panician corpuscles and smooth muscle. An excess of sun rays, upon skin contact, produce sunburn and DNA damage. To overcome it, melanocytes use sun’s energy to synthesise melanin from tyrosine in melanogenesis. 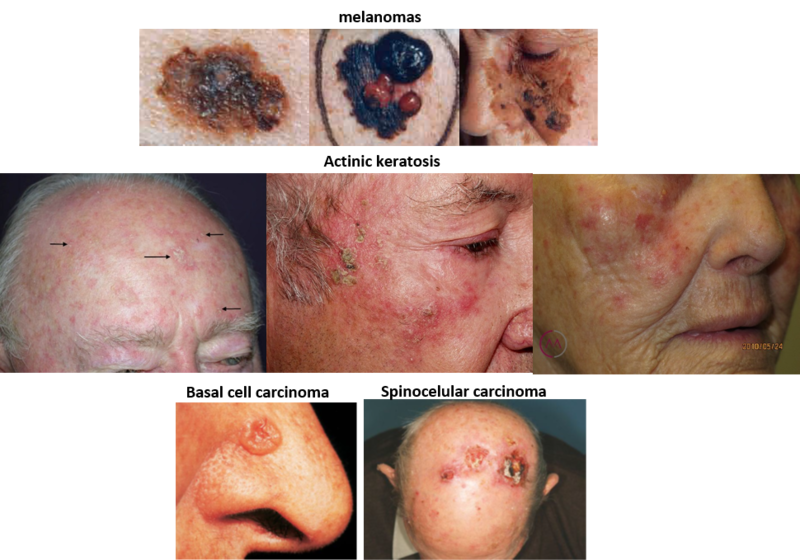 This process takes place in melanocytes corpuscles called melanosomes. Through melanocytes arms, melanosomes pass to keratinocytes giving them a darker pigmentation. Keratinocytes renew from the basal to the superficial layer of the epidermis, as a result, we end up losing our tan. In tyrosine photooxidation, two pigments are produced: eumelanin (brown/black) and pheomelanin (red/yellow) I was never accurate describing colours. Both pigments are responsible for our skin tan, and their proportion determines our skin colour. Genetic and environmental factors influence in their ratio. Most noteworthy, in a lighter skin person, melanosomes degrade faster, getting in a lower proportion to the superficial layer. UVR increases melanocytes and melanin avoiding radiation damage on skin cells, tanning is a protection mechanism. Darker skin people degrade slower, so they tan faster. Some people lack melanogenesis enzymes, hence, they show decreased pigmentation. For instance, albinos lack tyrosinase, which converts L-dopamine in L-DOPA. Phenylketonuria patients have a mutation in their phenylalanine oxidase, being unable to synthesise tyrosine from phenylalanine. In addition to a lack of pigmentation, they have to control phenylalanine levels in order to avoid dangerous metabolites. Obviously, other pigments, located under our skin, absorb sunlight as well. That’s the case of β-carotene, bilirubin and others that affect our skin colour. In this post, we will just focus on melanin and sun effects. Physics shows us how light interacts with energy. When light with a determine λ hits an atom, several effects can happen. The photoelectric effect is a phenomenon where an electron is extruded from the atom. UVB radiation is absorbed by skin cell´s DNA generating pyridine dimers. This product alters DNA double-strand helix hindering its replication and expression. In addition, free radicals from other molecules are generated, and they can react and change the DNA the cell membrane or other cell molecules. Collagen and elastin fibres are also damaged by UVB affecting our skin appearance, the photoaging definition. The immune system is supposed to deal with all this damage, but increased and repeated sunlight exposure damages as well the immune system cells. Cells have the ability to repair DNA damage. This discovery provided Lindal, Modrich and Sancar, the 2015 Nobel Prize in Chemistry. 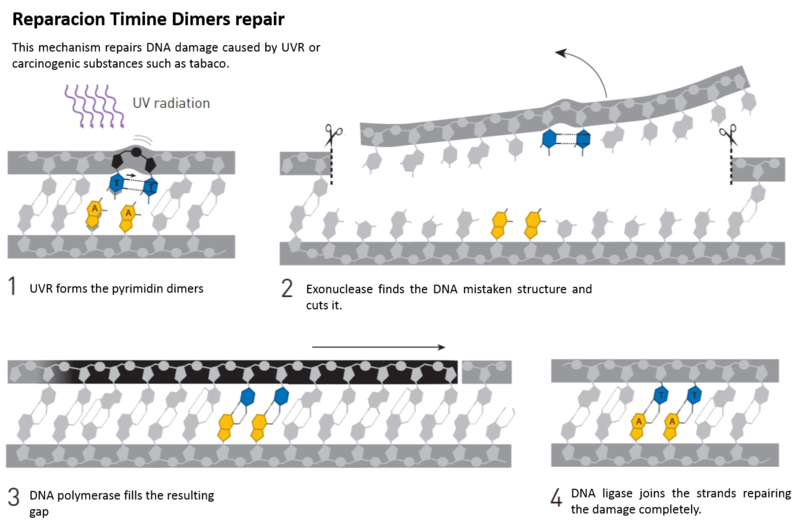 There are different types of DNA damage and DNA repair, the following graphic describes how UVR damage is repaired. oncogenes, their mutation is one step closer to cancer. Tumour suppressor genes, they avoid tumorigenesis. DNA repair genes, they repair modified DNA molecules. For instance, mutations over tumour suppressor gene p53 have been associated with multiple tumours, including skin main cancers. Are sunscreen components toxic? According to European security standards, sunscreens are safe. Norwegian and German research groups found how vitamin A, retinol, could accelerate skin cancer. So retinol palmitate was removed from sunscreen. Several groups tested sunscreens, here you have a deep analysis where avobenzone and meroxyl (ecamsule) were finally found harmless. Others, paracetamol, paclitaxel, oral contraconceptives. In conclusion, the best protection against skin cancer is avoiding prolonged sun exposure. But remember that to completely avoid sun exposure has been classified as dangerous as smoking. Some minutes under the sun are enough to get our vitamin D dose. Longer sun exposure might be harmful without the right sunscreen.